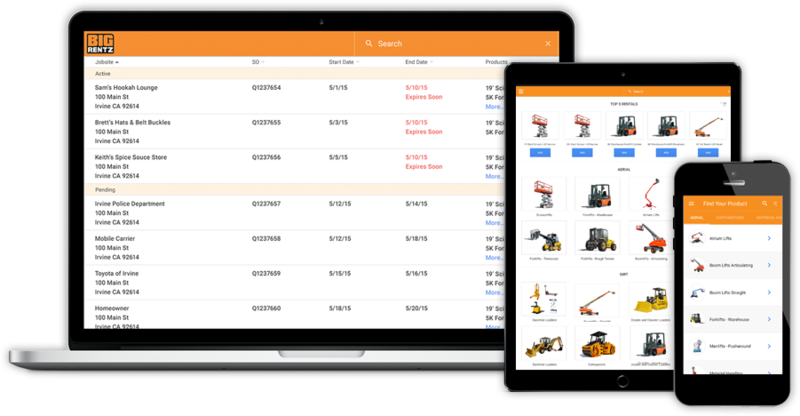 BigRentz, the world’s largest equipment rental network, today announced the launch of its online customer portal that will make it easier for BigRentz customers to view and manage all of their equipment rentals from any device, anytime. The responsive-design portal does not require any software downloads and adjusts to fit any screen, providing customers a consistent experience whether accessing their accounts on a smartphone, tablet or a desktop computer. For information on how to access the portal visit BigRentz.com/CustomerPortal. Request a Quote – Customers can quickly select the equipment they need, submit the required reservation details and request a price for everything from equipment to hauling. View Rental Status –Customers have the visibility to all the details on their rentals, from delivery times to pickup dates or the status of pending reservations. Terminate Rentals – Customers can easily release their equipment for pickup with the click of a button and instantly receive their termination number in the portal. Extend Rentals – If customers’ projects are running long, they can modify the end date and extend the rental period. Report Issues – Customers having issues with the rental equipment can report problems through the portal, providing a single location for ongoing correspondence regarding rentals. Real-time Notifications – Customers and their jobsite contacts receive real-time emails/SMS notifications regarding their rentals delivery and pickup status. Additional information about the BigRentz Customer Portal is available at BigRentz.com.